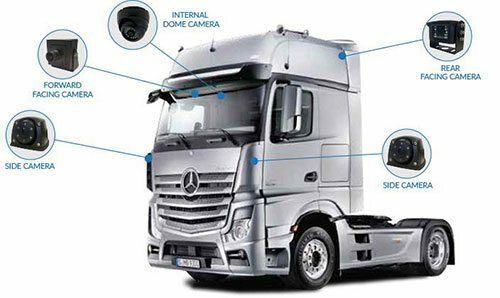 There is some confusion around placement of cameras on HGV vehicles, especially related to the trailers. This article outlines where, why and how this can be handled. When it comes to placing cameras on and in the tractor unit, the world, as they say, is your lobster! The typical configuration is a 3-camera system, with a forward camera permanently mounted just at the top of the windscreen plus 2 side cameras. These can be mounted either lower down or higher up on each side of the cab as desired/required. But, you do have some other options. You can also install an in-cab dome camera to record the driving area in the event of break-ins and attacks on the driver. We have also installed cameras at the top of the rear wall of the cab facing down. This is particularly popular for fleets that travel through areas with illegal immigrants trying to hitch a ride or for attempted trailer thefts. A camera placed at the back of the trailer is obviously useful for seeing any incidents that occur behind the vehicle. However, it is also useful for seeing the lead up to an incident where someone then hit the side of your truck. Finally, attempted break-ins can be recorded. For this reason cameras can be placed low down or high up, facing down, or both. Multiple cameras can be placed inside the trailer dependent on the need. You may simply want to monitor the goods being carried, in which case a single infra-red dome camera would suffice. If you are concerned with illegal entry to the load space, then one or more dome cameras placed to face the back and side doors, will capture the full space and the doorways. Additional to the cameras, ProVision DVR units accept multiple data inputs that will trigger ‘events’. This can include alarm, doors opening, tailgate operating, reverse gear and indicators, among others. This allows you, the fleet manager to be immediately notified every time the trailer doors are opened, say outside of normal hours and in turn this creates an event recording for review. The only additional thing required for the installation of cameras on the trailer is an additional Suzie lead. This lead along with corresponding connector and cabling can all be provided by our team and installed by our professional trained installers. So, when you come to connect your trailers, you would then connect 2 Suzie leads instead of 1 and hey presto, you are wired for vision all around and in your HGV. So, whether you just need a single forward-facing camera for your HGV or 8 cameras in and around your cab and trailers, ProVision has the solution for you. Give us a call to find out more.